WHAT IS DIAMOND ART PAINTING? U.S. ORDERS OVER $75 SHIP FREE! Our kits include everything you need to get started! Sandra P. Reviewed by Sandra P.
The packaging was done with great care. The DAC box inside a shipping box, no crush boxes here. The feel of the canvas leaves you speechless. All resins accounted for and the brightness of their colors, something you must see for yourself. Linda G. Reviewed by Linda G.
This came out WAY better than I thought it would!! I adore it!! Darlene B. Reviewed by Darlene B. Now it's very enjoyable. I just started Wisdom, my third one, three days ago. I'm very glad that I have my light pad now. Because I have good light and can use both hands, it's going a lot faster. I liked everything about it and disliked nothing. This picture is wonderfully bright and colorful. I chose this because I liked the bold and bright colors. It has been lots of fun watching the wonderful colors come alive. Beautiful colors vivid and bright. Easy to read and see placement and icons. 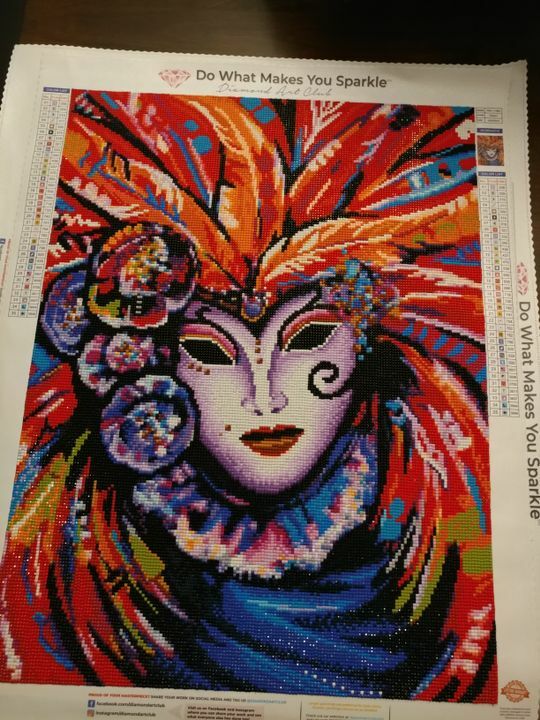 A look inside what makes Diamond Art Club diamond kits unique! Born out of passion and the pursuit of creativity, Diamond Art Club™ is changing the industry standard for 5D Diamond Painting. Our detailed artwork printed on premium canvas and made with high-quality diamonds shine brighter and look better in real life than on the package. Our kits include everything you need to immediately get started on your new piece of art, including a premium velvet tarpaulin canvas that’s soft to the touch, high quality color-coded resin rhinestones, a diamond applicator, a wax pad, a craft tray, and easy to follow instructions. Cut with 13 and 26 different facets to reflect more light and made with 100% epoxy resin for richer, more jewel-like colors, Diamond Art Club™ diamonds shine the brightest! We offer three different types of diamonds including round diamonds for easy application, square diamonds that fit edge-to-edge for a total mosaic look, and AB diamonds that have an iridescent coating that mimics the glow of the Northern Lights. Our Diamond Art Club™ kits come with a premium, patent-pending velvet tarpaulin canvas that’s both soft and durable, while being waterproof. We cut each canvas with a special serge hemming technique instead of leaving the edges rough, so that it looks tidier and feels better to work with. Since the canvas is engineered to roll out smoothly and lay flat, you won’t have to spend time smoothing out the canvas out of the box. And if any accidental creases happen while you're painting, the canvas will quickly release any fold marks. Never worry about diamonds falling off your painting again! Diamond Art Club™ uses a proprietary, high-tech adhesive formula engineered for easy application and long lasting hold. No sliding out of place, or falling off, even in high humidity! Our canvases also feature a transparent adhesive covering, allowing you to see the entire painting at any given time. Visualize the finished artwork and see your progress on your painting as you create. We proudly provide crafters with the largest selection of unique diamond artwork, working directly with artists to license and create paintings to suit any taste and decor. You won’t find these original diamond art paintings anywhere else! To ensure our paintings has the same detail and beauty as the original design, our designers use a special, labor-intensive technique to translate original designs into a diamond art template with supreme clarity and perfectly matched colors. This also makes the symbols on your patient easier to read and understand for a more enjoyable creative process. It's so easy to get started! Peel off the adhesive covering the pre-printed canvas. Identify a symbol you’d like to work on. Locate the symbol and corresponding color code on the side legend. Identify the bag matching the color code. Pour the gems into the included craft tray. Press the tip of the magic applicator into the wax. Use the magic applicator to pick-up a gem from the craft tray (over the faceted side). Place the gem onto the corresponding symbol on the chart. When finished, frame your masterpiece and hang it up on the wall! Which to choose? It’s a matter of personal preference and our diamond art painters will tell you any choice is a beautiful choice. Round drills equate to easier and faster fun. Unlike square drills, you don't need to meticulously place each round drill on the canvas. Round drills have a noticeable sparkle - unique to their 26 facets. Square drills are the perfect option for those who want the fullest representation of their artwork. Although placing them require more precision, Square drills benefit from fitting edge-to-edge. With no canvas showing through, they help provide a complete mosaic effect. The Aurora Borealis (AB) drills are our premium option. We use them as accents to create a glowy effect across your finished painting. These iridescent drills have a special coating that simulates the colors of the Northern Lights. They’re shimmering, ethereal and completely beautiful. The larger the size, the more detailed your painting will be. We can fit more colors on larger sizes. I’d like to subscribe to the DAC newsletter featuring special offers and new products. © 2019, Diamond Art Club. Keep your diamonds neat and organized with this must-have accessory!